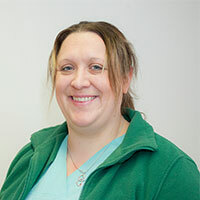 I have worked for Mulberry court since 2006 as a Registered Veterinary Nurse. I have a special interest in anaesthesia and patient care. In my spare time, I like to ride my horse and spend time with my family. I have a few pets. I adopted Lola, a bulldog, 2 cats, Aston & JD, 3 guinea pigs, a royal python and a horse called Crystal.